Whispering Canyon Cafe is a casual restaurant located in Disney’s Wilderness Lodge. They serve American food, with a Western cowboy twist and ambiance. The atmosphere here is pretty fun and definitely family friendly. The servers are also known to play jokes on you and tease you a bit (don’t believe me? just ask for some ketchup…). My family came here for breakfast and I had my eye on the slow smoked barbecue pulled pork and over easy egg sandwich ($10.99). The sandwich came with a massive heaping portion of pulled pork. The pork was very tasty. It was smokey, tender, and it had a hint of sweetness. 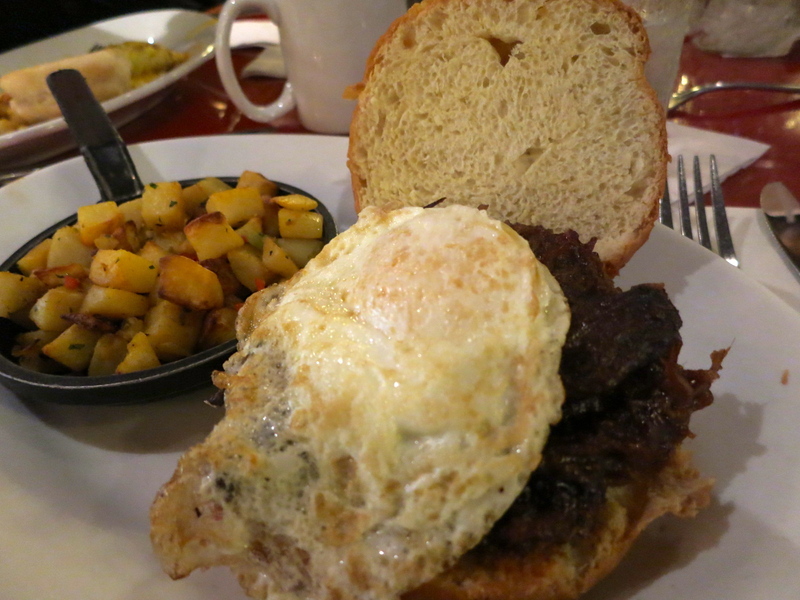 The over easy egg on top added some richness when the yolk burst all over the sandwich. This sandwich comes with a side of breakfast potatoes that are spiced with a bit of herbs and chunks of peppers. These had good flavour, but some of them could have been a bit more crisp. Overall I was very satisfied with this sandwich. It’s a pretty big and heavy meal for the morning, but I’m down for pulled pork anytime. Whispering Canyon Cafe is a good place to come for some hearty, meaty, food. Yes, for a fat, delicious, breakfast sandwich.